The famed Guntur dry red chilli, a hot favourite in Asian countries, is yet to strike it big in European and American states. While a lion’s share of 1.5-lakh tonnes of chilli is exported to Asian countries with little margins, the exports to more lucrative Europe and U.S. markets is just over 25,000 tonnes. 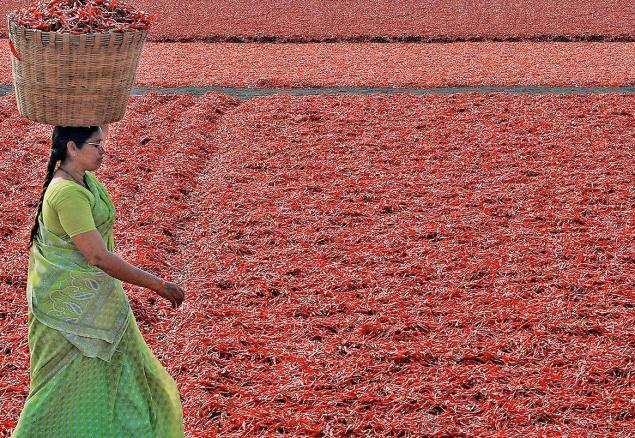 Chilli is grown in over 75,000 hectares in the district with a total export volume of 3.5 to 4-lakh tonnes. Farmers have been indiscriminately using pesticides to overcome insect pests and diseases. Chilli traders have been complaining that high pesticide residues and aflatoxins in dry chilli have dented exports to the U.S. and Europe, with more stringent global mechanisms on pesticide residues. “We have a major crisis in hand, and our farmers and traders have been losing substantial revenue. We have decided to adapt the Integrated Pest Management (IPM) techniques to overcome the crisis and educate the farmers to opt for integrated nutrient management by using organic fertilizers,’’ Deputy Director, Horticulture, K. Jayachandra Reddy, told The Hindu on Monday.